Companies and charities should have different objectives when they work together…this is ok. I recently heard about a company who said their objective for working with charity X was to raise a certain amount of money. This, in my mind, should be the objective of the Fundraising Director of the charity, not of the corporate partner. Surely their objective is to sell more product. I know one of the most successful partnerships I worked on grew because our corporate partner sold more of their product around the time of the partnership. And we raised more money. The company of course benefitted from a halo effect working with us, but ultimately their revenues increased. I would love to start seeing companies being open to the fact that its ok to engage in a partnership with a charity to generate revenue and sell more products. I think if this reluctance was removed we could start to see charitable partnerships sit firmly within marketing departments and actually become even more effective. If you look at an organisations objectives behind a major sponsorship it isnt simply to do the right thing. They are very clear about why they engage in the partnership and what they want to get out of it and one of the main points will be…to shift more of their products. If there was a change in this direction I believe we would start to see even more successful charitable partnerships, even greater alignment between companies and charities and longer term more sustainable partnerships. What do you think? Am I off the mark here? I have been talking to people a lot about Facebook Vomit lately. Sounds gross…but its more annoying that gross. Facebook Vomit is where your brand over posts on facebook….or spews information out onto your news feed like a technicolour yawn! So don’t just go onto Facebook because you think you have to be there and when you are there don’t just post content for the sake of it or too often. Have a content strategy and publishing schedule (contact me if you would like some help developing one). UNICEF Ireland have launched a personalised video campaign. The video was sent out to their 12,000 online donors, obviously the plan is for it to be spread as they aim to raise 1 million euros. The personalised campaign suggests that you (the donor) are the reason why UNICEF Ireland fell short of its target by just 1 euro and then asks you to donate that euro by text (I believe you can also go online to donate). I actually like the focus on a small amount. I think its smart and they have made it really easy to give by text. I am a big fan of personalised videos, I think they are really clever. I also like how they have been able to use two real news reporters in the video. My only concern about it is around the accusation that you, as a previous donor, are the reason why UNICEF Ireland missed its goal by just one euro. I just wonder how it will make donors feel? Its certainly a gutsy move by UNICEF and for that they have to be applauded. 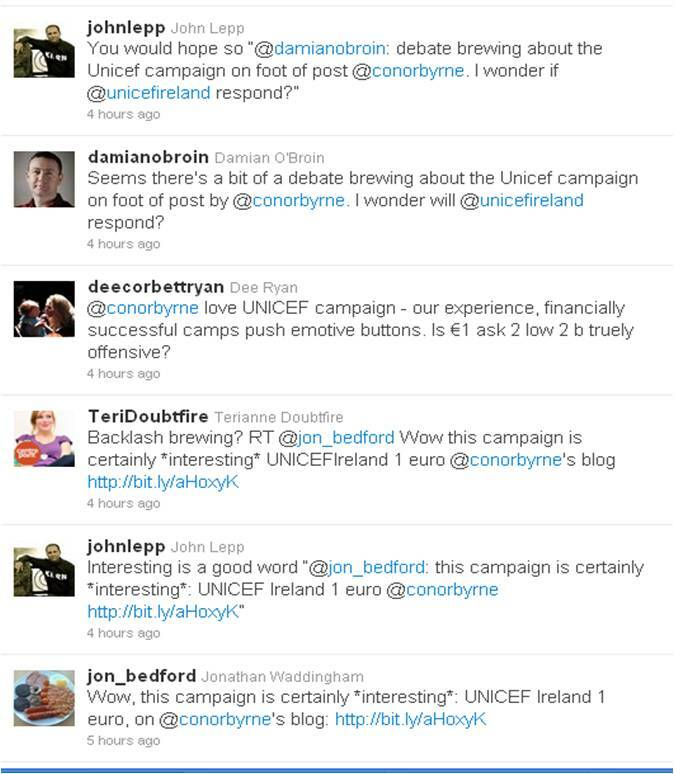 just received the most insulting mock video from unicefireland. How their fund raising / marketing department let this out is beyond me. 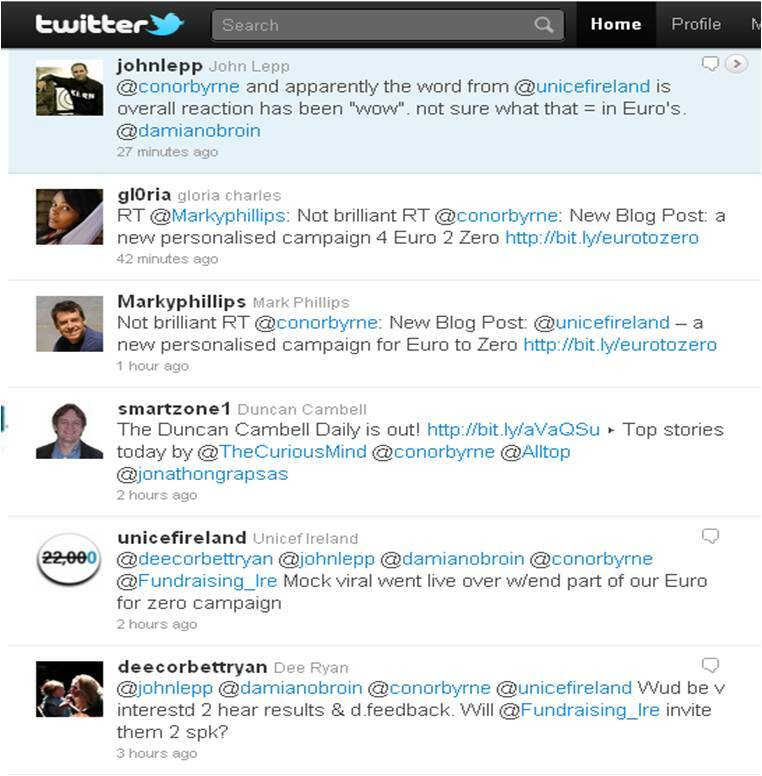 Anyone know if the Unicef Ireland email I’ve just received called Six News is a junk one or real? Daren’t click the link! What do you think? Click on the image below to see the site in action…. throughout the day there have been some interesting comments about this post on twitter which I thought I would add. If you have any more I would love to hear them. I was invited to attend the launch of the Thank You book by the Irish Hospice Foundation yesterday. When I got the invitation I thought, interesting, but just another charity book launch. I was wrong. This is a wonderful feelgood project that goes way beyond the book, in fact this has the potential to become a Movement. The idea is simple the Irish Hospice Foundation are launching a National Day of Thank You, they want people to stop and say thank you to someone, for something, anything. As Bill Hughes said at the launch “imagine if everyone in Ireland woke up that day to a thank you card in their post”. Thats a really nice idea. And of course the foundation are selling you cards (and e-cards) which you can send your thank yous on (so yes it hopes to raise money from this). The book is also part of the campaign and they are encouraging people to buy the book and then take the time to capture things they feel grateful about. As someone who is doing a degree in the area I really enjoyed listening to Psychologist Marie Murray. She pointed out at the launch that there are health benefits to being grateful, scientific research shows that people who express their gratitude daily are 25% happier and healthier than those who dont! I tend not to post about specific fundraising projects, so why this one? Well I like that its a really simple idea. As I listened to the explanation of the project unfold and the background to it, I couldnt stop thinking about the add-ons to the campaign. I also liked the idea of the Thank You Day, a day that focuses the mind is always good, and this is also piggy-backing on something that people tend to do (maybe not as much as we should). There is also an incredibly good feeling about this campaign, in fact I think there is so much that can be done around this that could really create an incredible movement. I am doing a bit of work with The Alzheimer Society of Ireland around an online campaign and we are looking to get together a small group of people to attend a preview of the campaign. We would like to get some feedback from people on the campaign itself and also how we can best spread the word about it online.